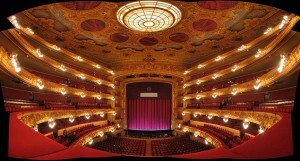 The Gran Teatre del Liceu is the complete name in Catalan for the Opera house in Barcelona. 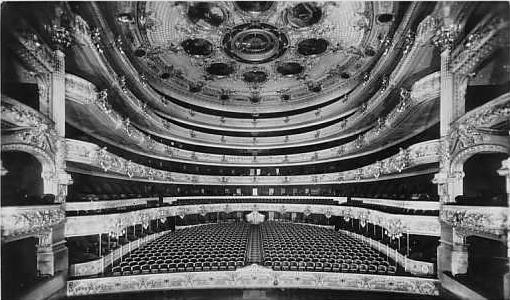 Commonly known as ‘Liceu‘, it was constructed by architect Miquel Garriga i Roca and it was opened on April 4, 1847. The first disaster occurred on April 9, 1861. Rebuilt works were performed by the architect Josep Oriol Mestres and was reopened on April 20, 1862. From the old building only the façade, the entrance hall and the mirror’s hall remained (photo is from 1935). The second disaster occurred on January 31, 1994 because of a spark in works under renovation. Catalonian society agreed on the need to rebuild a new Liceu. The new Liceu preserved those parts unaffected by the fire, the same ones that had survived the 1861 fire. The re-opening was on October 7, 1999 with Puccini’s Turandot as was scheduled in 1994 before the fire. Among the composers most plays have been reproduced in the Liceu include Verdi, Donizetti, Wagner, Gounod, Meyerbeer and many more. Most performed operas in the history of Liceu are ‘Aida‘ and ‘Rigoletto‘ by Verdi and ‘Faust‘ by Gounod. 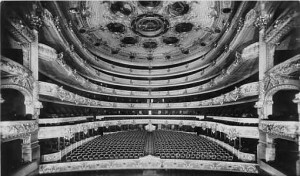 Since its inception, the Liceu has always enjoyed the works and performances of the best composers, conductors, musicians and opera singers making this theater a real privilege for the city of Barcelona. For information on upcoming performances make a click on the Liceu’s program. Tickets for performances can be bought at Sant Pau street no. 1, online or by ticketmaster 902 53 33 53 or +34 93 274 64 11 for international calls. Tickets for guided (10:00 am) or unguided tours (from 11:30 am until 13:00) are available. Prices are 11.25€ for guided tours and 5,50€ for unguided tours.